I don’t know why WordPress.com doesn’t let you post pictures in the comment replies section. Perhaps I’m just not doing it right. Oh well. Yes! It matches pretty much perfectly. Unfortunately, my Macbook Pro is away for repairs after a complete hard drive failure -I am getting it fixed by Apple for free as it is under Apple Care and they admitted that the way it failed was clearly a mechanical failure- otherwise I would send you a picture of how well it matches. Personally I never use iPhoto. For me, using iPhoto is like bashing my head repeatedly against a brick wall. Gods forbid that something straightforward like organising my photos into simple user-friendly folders should be anything other than incredibly fantastically complicated! About a year ago I decided that, although I am not a professional artist, I was ready to take the next step and purchase a graphics tablet. But as graphics tablets are a rather expensive treat (especially in a time of recession) I decided to spend a year saving for it. I therefore had a looooong time to do my research. I have been there, I have done that, and I have got the T-shirt, or rather, in this case, the graphics tablet. My first problem was that I didn’t know anyone who had a graphics tablet so I didn’t really know where to start. So after reading countless recommendations for “first tablet” “tablet for beginners” “tablets for amateur artists” etc. I found that overall the Wacom Bamboo series had the most recommendations. But here I encountered my first problem. I found that the highest number of recommendations within the Wacom Bamboo series went to the Bamboo Create, the Bamboo Capture, the Bamboo Pen and Touch, and the Bamboo Fun Pen and Touch (small and medium versions). But nowhere could I find any people who reviewed the Bamboo Create AND the Bamboo Fun Pen and Touch!! Which, to me, looks pretty flimsy. 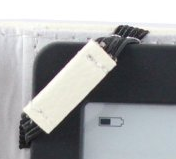 I mean basically there are just these 4 bits of string between your Kobo and certain e-reader death. Plus elastic wears out over time so surely this is not a long term solution. However, as I DO NOT ACTUALLY HAVE ONE, nor have I used one (apart from trying it in the shop), I can’t say how well this works or how long the elasticity lasts. But I wasn’t about to risk it. After searching unsuccessfully for some time I discovered an extremely crucial and vital detail. The Kobo Touch and the 4th Generation Kindle are ALMOST exactly the same size!! The Kobo Touch measures 165mm by 114mm (6.5″ x 4.5″) and has a depth of 10mm (0.4″) while the Kindle 4 measures 166mm by 114mm (6.5″ x 4.5″) and has a depth of 8.7mm (0.34″). Aha! The scope was vastly expanded due to Amazon’s stock of cases for it’s own e-reader.